I have confirmed this issue, we will fix it in next update. I can't understand your question. Here is a reviewed and updated version of the German language file by <Latino>, based on the work of Harmut Hoyer. An assistant that search for leftovers (folders, files, registry keys...) after uninstall any program would be great. 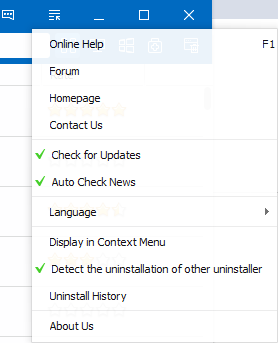 Current Wise Program Uninstaller has included this feature. we are continue improving it. They should be inside the portable folder (or in a folder inside it). When another installed program gets updated, WPU seems to run a scan and offer to delete leftover items once the update is finished. It did it a couple of days ago with Bandizip. It just now did it again with Firefox. Is it safe to delete those items? It looks to me like they are vital components that should stay. 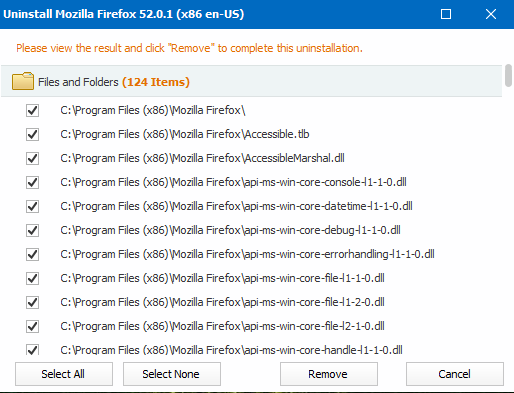 These are not programs that are being uninstalled and removed, but programs that are being updated. So their updater is uninstalling the old and then reinstalling the new version. 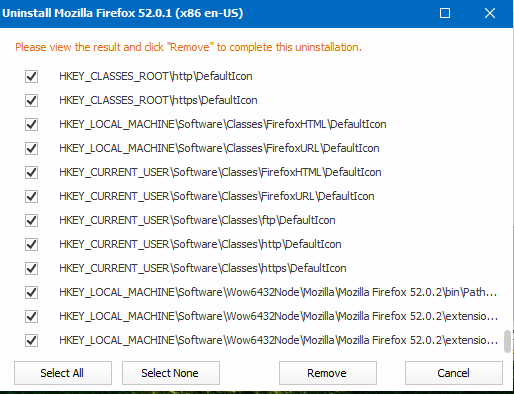 For Firefox it's asking me to delete 124 items including program files items and registry items. I'm worried that if I go ahead and let WPU delete these then Firefox will be broken? This is a new function of Wise Program Uninstaller. Sometimes it pops up too early that uninstallation process is not end. We keep on improving it. My suggestion is, ignore it and disable the monitoring settings from Menu. I don't seem to have any such option in the menu. ...Unless it's the mysterious "Detect the uninstallation of other uninstaller"? I have no idea what that means. Is that what you're saying we should disable? When you open wise program uninstaller, it will load all installed programs. This may cause high CPU usage. When wise program uninstaller try to scan leftovers, this also may cause high CPU usage. The program currently doesn't detect the new version: I'm using 2.2.5.120 (portable). I'm going to update it. It also saves *.file, *.file.list, *.reg in the program folder: I suggest to save them in a sub-folder (called data?). I will send your suggestion to developer team. You can try Custom Uninstall, add the folder you want to uninstall.